June is still not over but it is almost time to say goodbye to Summer Crochet (including Amis) and start thinking of a new theme. To make things a little less complicated with votes etc. June and I were thinking to have a theme where everybody could show their W.I.P.s. 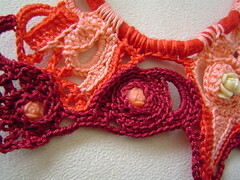 Anything crocheted you are working on right now; show us some action photos and of course as always the finished work. Don’t forget to leave your comment….! and for people who have been lurking on this blog now is an awesome time to come and join us. I think that’s a great idea… and hey maybe it will spur some of us to action to actually get some of these done! Like a W.I.P. support group…UFO’s Not-So-Anonymous. “My name is Jaime, and I have 14 unfinished projects, 12 of which are hideous monstrosities that should be allowed to die with dignity, except that I know how much I payed for that yarn. Oh by the way, that necklace is drooly, want want want. I think it is an excellent theme and only for 1 month. That’s a good theme idea. I have several UFOs hanging around. I also have some summer items to show if I ever get around to taking pics. It’s been a crochet-crazy-busy around these parts lately. Can I copy that WIP poem and put it up? I can totally get behind that. Miriam… have at it! 🙂 “Higher Power of Choice” is, of course, changeable for whomever or whatever you wish! There’s room for everybody in the world. LOVE the oath / prayer, jbirren!!!! Now if I can only find the disc to upload all of the pics from the camera … I can show you all a couple of things I’ve got hiding away. The baby blanket that has turned out so huge my nephew will be able to use it for life? The slippers for my youngest sister that were supposed to be for her birthday this past March? Or perhaps the longest-held WIP I have … an afghan for my brother’s wedding … almost 5 years ago! LOL … count me in!!!! But the best thing about the WIP theme is… you can show off ANYTHING you are making! I love this idea. I have at least five WIPs floating around the house. Maybe I can actually get one of them finished. Hi, just found out my picture here… What a lovely blog! Thank you so much for mentioning my work! !